Opium Half LIfe: How Long Does Opium Stay in Your System? How Long Does Opium Stay in Your System? Opium is dried latex gotten from the opium poppy. Drugs that contain opium are referred to as opiates. Opiates interact with your system at first beginning with your brain’s opioid receptors. Opium is primarily responsible for producing narcotic substances like morphine, codeine, etc. Opium is a highly addictive substance, and one point in time, one-third of Chinese male population reported their addiction. The million-dollar question is how long does opium stay in your system? The answer depends on several factors. In most natural conditions, drugs containing opium don’t have long half-lives. Half-life is the amount of time a drug stays in our system before metabolizing to 50% or less. Having established this, it becomes very understandable that opium containing substances would leave your system in no time. The duration opiates stay in your system is connected to an extensive range of factors, chief among this is the type of ingestion. If you took the drug orally or you smoked it or had it injected into your system, or even snorted, intake is essential. Getting opium into your system by injection or possibly by smoking it has exaggerated effects that could overwhelm you with high activity and reaction time when compared to when you take it as a pill orally. This way, however, opium quickly leaves your body when compared to the longer time it would take if it were oral ingestion. Other factors may determine how long opium stays in the body. Among these are the health of the liver and kidneys, the mass and weight of the opium recipient, his body fat, and the amount of opium you took in as well as the quality of the opiate. Substances containing opium when taken into the body could have a half-life oscillating between an hour and nine hours corresponding to the quantity of opiate you ingested as well as the kind of opiate. Thus, we see that while that codeine would have a half-life no more than 4 hours, its opiate counterpart morphine has a half-life not exceeding 6.5 hours. The quantity of opium which your body may display has a lot to do with the type of drug test that was carried out. Let us, therefore, look at the following tests and the number of hours, opium (or opiate) would show in them. An opiate like codeine will show up positive in urine tests for up to two days. Morphine would take no lesser than two days either. Blood tests could turn up positive to opium substances like morphine for like 7 hours. Hydrocodone another opiate would stay in your blood detectable by blood tests for one full day. Opiates would show up in hair tests for an extended period. Sometimes an opiate would be detectable in hair tests for seven days, ten days or even up to ninety days! Opiates don’t usually stay in your saliva for an extended period. Opiates shouldn’t take more than 36 hours in your saliva. Sometimes it is even brief as 5 minutes after use, and they don’t turn up positive again in saliva tests. When you take in opium into your body, the substance containing the opium connects to your brain, going on to activate the u-opioid receptors whose functionality is very significant to your central nervous system. The effects of such u-opioid receptors spread as far as your intestines. So most times depending on the particular opiate you ingested, the opiate would enact changes in the brain’s receptors. From there the brain is triggered to manufacture a new set of “pseudo” receptors attaching up the opiate which explains the sense of exhilaration that comes with the drug. But when it leaves your brain, your brain is left with several “pseudo”-receptors that beat the natural receptors, which may bring an impelling mental force to take the opium again. Hence we see the reason behind opium addiction. Now you know how long opium stays in your system, but how about the effects, how long do they last? Well, when you take in a dosage of opiate, you are likely not to feel the effects till an interval of fifteen minutes. The calming effects of these opium substances could stretch into six hours. Once you ingest opium, your body which is very sensitive to it will absorb it after which the effects of the opiate manifests. The effects could trail out in a day. In most natural conditions, you are likely to excrete the drug in about five days. However, as we have earlier pointed out, traces of such opium would be in your body for days and even in your hair for months. 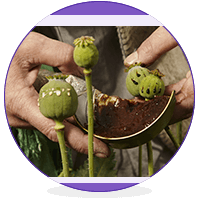 Addiction Resource » Addictive Substances: The Anatomy of Drug Addiction » Opium – Everything You Need or Want To Know About Opium Addiction » How Long Does Opium Stay in Your System? IF A PERSON USED TO TAKE OPIUM 6 MONTHS BACK, AND NOW IF WE DO THE DOPE TEST, WILL IT BE POSITIVE?